Temperature! – Have the room up to temperature – the piano and the piano tuner would both appreciate having the room at a comfortable temperature. Silence Please! – Your piano tuner is listening very closely to sounds you may not even be aware of, and he/she is often trying to hear and count “beats”, a critical part of any good tuning that is particularly challenging to hear. Zero noise would be ideal, but if that isn’t possible at the very least no television and no music playing. Do You Have to Make so Much Noise? – Yes, your piano tuner has to make a fair amount of “noise”. They have to strike every note several times to get the pitch just right and to get the tuning pins and the strings to be as stable as possible. 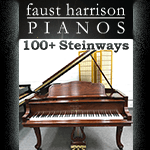 The average 88 note piano has approximately 230 strings, all of which have to be struck a number of times. Do the math, that’s a lot of notes. And yes we tend to strike them fairly hard, mostly because we want to drive you crazy do our best to make sure your tuning holds as well as possible. The Machine is Not the Tuner – If your tuner uses a “tuning machine” (aka Electronic Tuning Device), no it does not tune the piano for them, and yes they still need to have silence to do a good job. And they need to know the proper way to tune a piano, set the pins, regulate the action (if needed) etc. Which after all is what you are paying them for isn’t it? Think of it this way, just because someone buys a set of mechanics tools doesn’t make them a mechanic, or better yet, buying a set of scalpels doesn’t make you a surgeon. Please Clear the Piano Off! 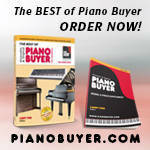 – Yes the piano tuner needs to be able to get at the inside of the piano. Even if it’s a baby grand the tuner will need to remove the music desk and will want to open the lid to have unobstructed access to the tuning pins (and to let the piano speak out). Please Keep Your Pets out of the way – Not all piano tuners are animal lovers (I happen to be one). But even if they are, after the initial “meet and greet” please take fido into another room. Think of it this way, if the piano tuner has to keep stopping to deal with your dog he/she is going to take longer and have to charge you more. Kids out of the way too – I have nothing against kids, rumor has it I was one once. If the child is well behaved and curious about the tuning, by all means I’m more than happy to give a brief explanation and demonstration. I think most piano tuners would say the same. BUT, if the child just can’t contain themselves, and/or is using the area around the piano to stage a wild marathon while yelling and banging a drum, please consider helping them find something else to do, preferably something quiet and away from the piano. Not Sure My Piano Needs Tuning? – If you can’t remember the last time your piano was tuned, I can assure you it’s out of tune. In fact it is probably way out of tune which may require more than one tuning to set it right again. Look at it this way, if you’ve ever watched the violinists in a symphony orchestra they tweak (tune) their instruments between each piece, and they only have to deal with four strings. Now imagine having around 230 strings (as is the case of the average 88 note piano), yes your piano is out of tune. And if it’s been years since the last time your piano was up to A440 (considered standard concert pitch), it may well take anywhere from two to several tunings to get it back where it belongs.